I’m deep in the final stages of thesis writing here, so I’ve got a bit of a “lazy” post this month. Last weekend I attended the bi-annual BC Studies Conference in Kelowna. This year there was a good deal of environmental and recreational history- themed presentations, including papers on the fertile ground between these two fields about the Skagit Valley in BC’s Cascade Mountains by UBC’s Phil Van Huizen, the Bowron Lakes in the Northern Cariboo Mountains by my UNBC colleague Mica Jorgenson, the Forbidden Plateau on Vancouver Island by Dr. Jenny Clayton. As always, the informal discussions between sessions and at dinner/a pub were my favourite part of the conference. Just as I was on my way out the door on the final day, I was happily informed that my paper on Garibaldi Park won the prize for best paper by an MA-level presenter. Below, I’ve included the opening passage of an earlier version of the paper (I think I like this intro better), in which I discuss efforts by Vancouver-based mountaineers to have a road constructed linking the city with the recently created Garibaldi Provincial Park. Essentially, Garibaldi was envisioned as a grand mountain park akin to the “crown jewel” national parks like Banff and Jasper, except that Garibaldi’s proximity to an urban centre would make it accessible to people of more modest means. In effect, Garibaldi’s advocates hoped that the park’s development would integrate Garibaldi into the Greater Vancouver urban network, “democratizing” access to wilderness in the process. from any afforded by other mountainous districts of British Columbia. Though undeniably wild and grand, in many ways Garibaldi Provincial Park is an urban park. As suggested by prominent Victoria artist A.M.D. Fairbairn in the 1932 Victoria Daily Colonist article quoted above, the ability to enjoy the solitude of a remote mountain setting without enduring a lengthy voyage was more than a pleasant convenience; it was at the core of one’s encounter with the Garibaldi landscape. The jarring experience of being rapidly transported between these two antithetical landscapes—like bolting between a sauna and a frigid winter lake—seemed both to enhance Garibaldi’s alpine grandeur, and, upon safe return, to underscore the exciting modernity of Vancouver. A.M.D. 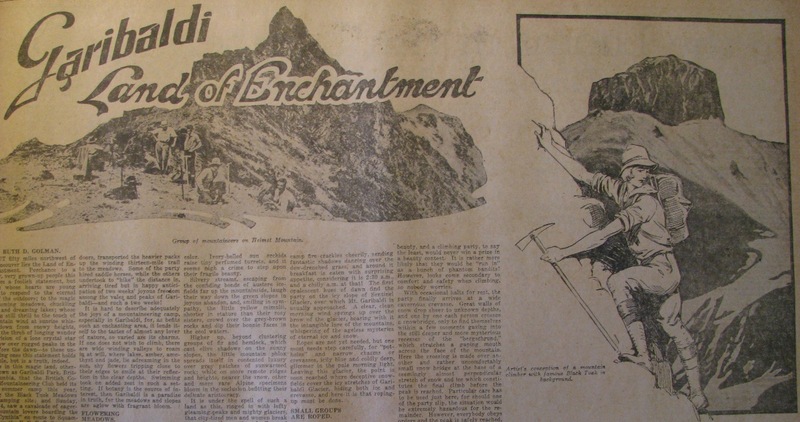 Fairbairn, “Vacationing in Garibaldi National Park,” Victoria Daily Colonist, 30 October 1932, t, p3 (magazine section). By 1932 Fairbairn could assume that such ideas would be well-received by British Columbia’s urban newspaper readership. A mere four decades earlier, however, most Lower Mainland residents would have considered the Garibaldi region as a marginal and mysterious wilderness. An earlier Vancouver Province reporter noted that even the much-closer Grouse Mountain, a 1,200 meter peak that rises abruptly from Vancouver’s North Shore, “had a far away sound… such as is associated with Timbuctoo or the South Pole, and no one seemed to care to break in upon the virgin slumbers of the Sleeping Beauty.”[ii] In the 1890s, just as British Columbia’s Lower Mainland was rapidly urbanizing, Vancouver-based mountaineers began their first forays into the alpine wilderness. While people had long ventured into British Columbia’s Coast Mountains, these mountaineers were peculiar because they did so simply for the sense of well-being they derived from experiencing these alpine landscapes first hand. No longer an ancient homeland, a place of work, a vast field of unexploited resources, or a regrettable, even “frightful” barrier to progress, the Coast Mountains were rediscovered as a still-wild, but now uplifting and “pure” natural environment. Driven by the discovery of new mountain vistas, these climbers soon ventured beyond the rugged, but relatively small North Shore Mountains. 1904 witnessed the first attempt by coastal mountaineers to scale Mount Garibaldi (2,675m), the volcanic massif that dominates the Howe Sound skyline, seventy kilometres up coast from Vancouver. Three years later, a similarly composed party finally claimed victory over the Howe Sound giant. These well-publicized expeditions drew attention to the region’s recreational potential while opening up a whole new field of alpine opportunity. Beyond Garibaldi lay a vast, unmapped expanse of sprawling glaciers, volcanic landforms, picturesque meadows, and jewel-toned lakes. This territory soon became the preferred destination of coastal mountaineers. Heavily flowered slopes above Garibaldi Lake. Photographer: John Davidson, ca. 1915. Courtesy City of Vancouver Archives. Through these activities Garibaldi came to be portrayed as “Vancouver’s Alpine Playground,” representing a new set of ideas which had obscured and displaced other narratives about the Garibaldi landscape. What began as the curious outlook of a handful of pioneer mountain-climbers became an increasingly normative way of thinking about the Coast Mountain landscape. The widespread social benefits attributed to this wilderness park, Garibaldi’s champions argued, would play a crucial role in Vancouver’s future well-being and continued ascent as a world-class, modern metropolis. 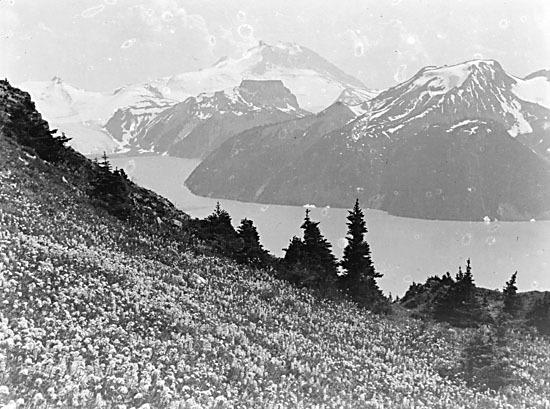 As such, the creation of Garibaldi Provincial Park was part of broader efforts to incorporate this region of the southern Coastal Mountains into Greater Vancouver as the city’s recreational hinterland. Local newspapers were highly supportive of plans to develop Garibaldi Park. Using colourful illustrations and dramatized story-telling, dozens of stories recounted excursions to Garibaldi and portrayed the park as a favourable travel destination for Vancouverites, if only a road were built. Vancouver Province, 6 October 1929, 5 (magazine section). Yet the campaign for park development put forth by Garibaldi’s champions was only partially fulfilled. Central to the “Alpine Playground” idea was the development of tourist accommodations and a motor-road from the heart of the park to make its recreational opportunities more accessible to residents of and visitors to Vancouver, any semblance of which would not come until the 1960s. Examining the failure to achieve this vision provides further insights into this crucial period of park formation in Canada. [i] A.M.D. 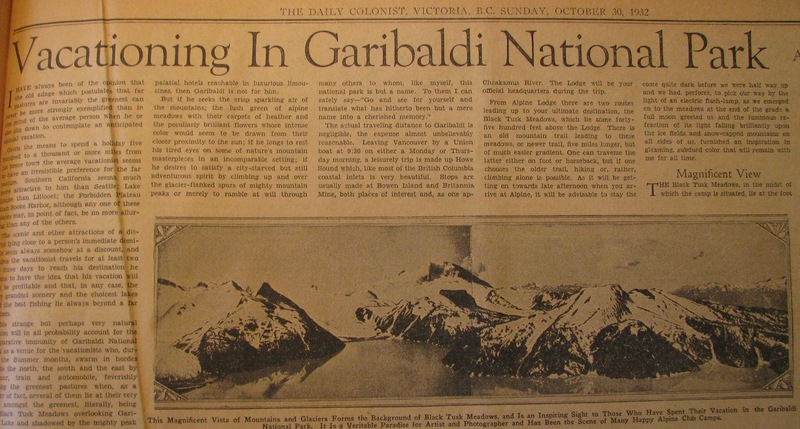 Fairbairn, “Vacationing in Garibaldi National Park” Victoria Daily Colonist, 1932 30 Oct. 1932, 3 (mag. sect.). [ii] “Bring on New Peaks,” Vancouver Province, 16 April 1910, 20 (2nd sect.). [iv]Report on Garibaldi Park and Contiguous Area, for the Honourable, Minister of Lands, B.C. (Victoria: B.C. Dept. of Lands, 1932), Frederick Charles Bell papers, British Columbia Provincial Archives (hereafter BCA), MS-1095..